Okieladybug's Scrap N' More: There maybe hope for her yet! I was on my way home one day last week and talking to my daughter and she said "when you get to the house don't look on the desk", meaning my craft desk, "because I used some of your stuff". Of course my heart almost stopped because I thought "she better not have used my cherry paper, my Basic Grey paper, etc, etc. etc. Then I decided I didn't care because I was just glad she was doing something crafty! Of course she wasn't here when I got home and I had to look on the craft desk because...well I see it almost as soon as I come in the door! I sat down and examined her work and then happened to look up and saw that she had used Design Studio as well! *okie's heart warms with pride* At that point I didn't care that she has used some of my polka dot ribbon that I won't use because if I use it I won't have it anymore. I didn't care that she has used some of my Prima flowers. I didn't care that she had used some of my precious Prism cardstock. I was just proud that she had made a project that she felt proud of! I noticed she had used my a photo corner punches and was quite pleased she knew what it was for, even though I know she has seen me use it! I was even more impressed when I saw she used some Glimmer Mist to spritz the cardstock. Now how she knew it was there and what it was for I have no idea! *okie thinks maybe her daughter pays a little more attention than what she seems*. The silver chipboard letters are some that I got at the Great American Scrapbook Convention and I was so excited I forgot to take them off the project when I took the picture. She took this to her dorm room and has it hanging on her wall! I have tried to get her to do things with me for a few years now and she is always busy or gives up but this makes me think that THERE IS HOPE FOR HER YET! 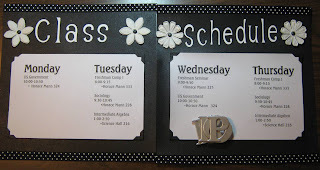 Ho Okie, your daughter has done a wonderful job, better than a scribbled timetable anyday. 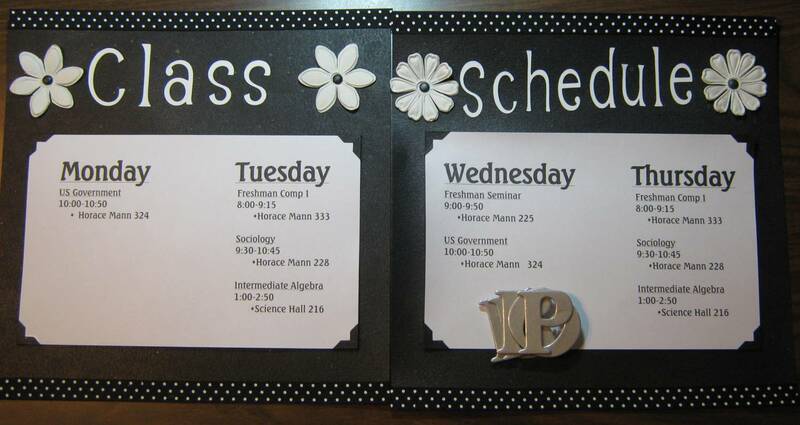 Your daughter did an awesome job with her schedule. The only thin I would say is for you to get more of that polka dot ribbon and send me some, lol. hugs to okie and her sweet daughter! Daughters can be such a surprise! 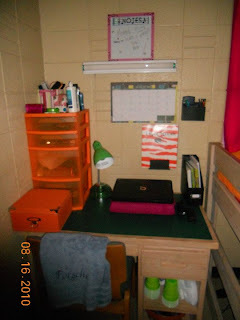 My DD claimed she didn't like scrapbooking and just laughs at my tools when a new one is added but she almost managed to smuggle my new i-rock in with her stuff on move in weekend (she's off to college too) You DD did a very nice job on the schedule! Ahhh A mothers pride!!! She has inherited your talent! You should be proud she did a GREAT job. p.s. I have paper that I dont want to use because it is too pretty and if I use it I wont have anymore. So I understand about the ribbon!! How proud you are of that lovely girl of yours! She did a great job and her dorm room looks great! (did you tell her the story of the fridge? I wonder if she has told her roommates??!) I love to read your posts, they give me a good laugh in the morning! What a way to start the day! See what an inspiration you are to all of us! My grandson loves the cricut, we do his school projects with it and he is 14! Good job MOM!! Aaah they can make us soooo proud at times. Congrats to your daughter on the start of a wonderful new adventure in her life. Oh that is so awesome..and she did a beautiful job. Also loved your tiger series.. just too cute. I think you're right, she has been paying closer attention than you thought! She did a beautiful job too! Of course you're proud! Tell her I'm proud of that project! 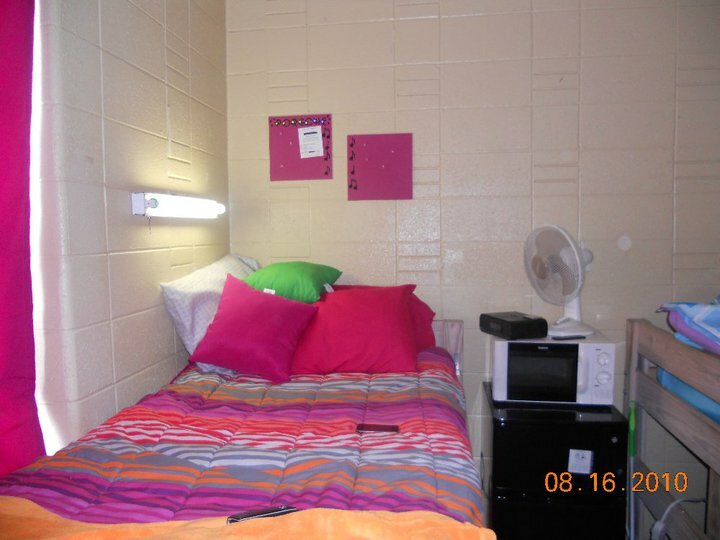 Looking at the dorm room photos---I'd forgotten how small the rooms are! No wonder I had to have a private room when I went to school. 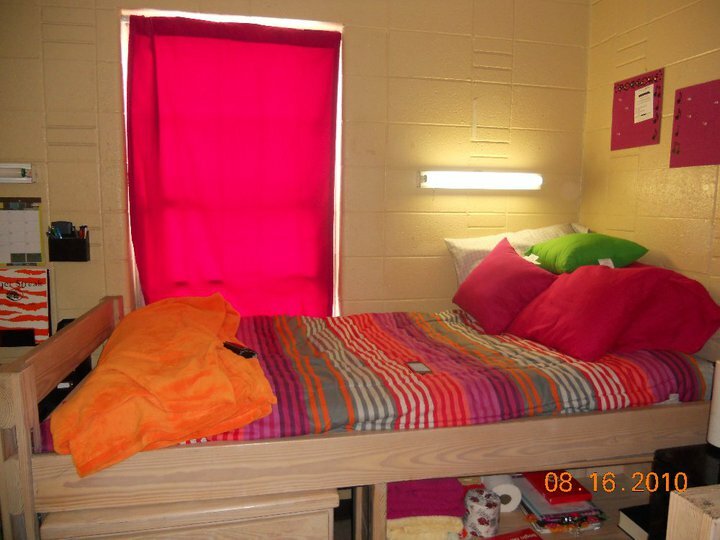 No way would me and a roommate have both survived living in such cramped quarters! I'm so glad that SOMEONE is using up your stash! LOL! Ahhhhh, I have tried to get my daughter to craft as well but my attempts are fleeting. Mostly she plans my intervention because she says I have an addiction problem. Seeing this gives me hope. She did a great job! So sweet! She did a great job! She did great Okie! You have every right to be proud of her! Oh what a proud moment! The extent of my dd's crafting is "mom, I saw something I liked and I want you to make if for me". There's definitely NO hope for MY dd - savor the moment with YOURS!! 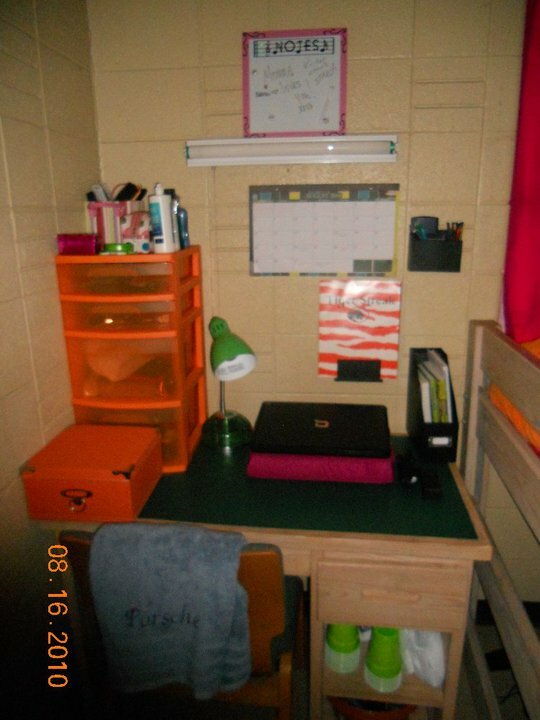 She has done a lot in that tiny little space that in her dorm room. 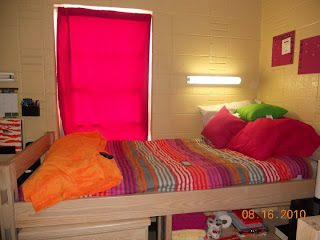 I love the wonderful bright colors! Of course my heart almost stopped because I thought "she better not have used my cherry paper, my Basic Grey paper, etc, etc. etc. She did a great job! You must be rubbing off on her, even if you don't notice it. I am so excited for you! To moms, it is the small things in life for sure. PS She has your talents! Great post! Don't you love it when they surprise you by showing that they actually listened???! Congratulations!! A crafting daughter! Mine is 15 and likes to draw and cut up magazines to collage. Not too crafty but used my Cricut expression for past reports, of course!! Your dd room looks like my son's at FSU in Florida. Grafton Hall. Enjoy this moment and congrats again!